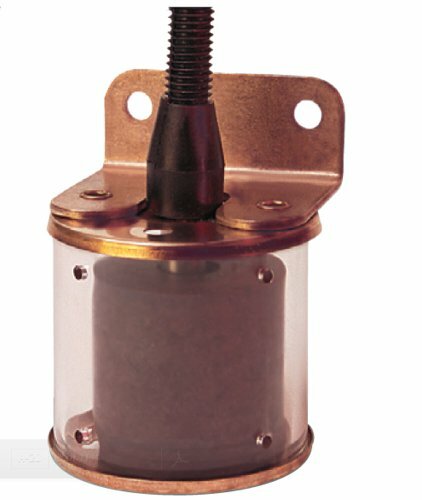 Gems Buna N float bracket mounted slosh shield single point level switch. Small, lightweight, and extremely stable in nonstatic, highly contaminated liquids. Slosh shielding minimizes effects of turbulence and helps prevent interference by foreign material. Bracket-mounted to any convenient surface. Ideal for use in oils and water. Stem and mounting material: 316 stainless steel. Other wetted material: Beryllium, Copper, Copper nickel, Polycarb and 304 Stainless steel. Minimum liquid specific gravity: 0.55. Operating temperature: -40 to 140 degree F. Maximum pressure: 150 psi. Switch level SPST: 20VA, normally open. 1-7/8" Float diameter. 18 GA, 2 conductor 72" Neoprene cable with water proof connection. LS-270 Series Note: Installed vertically with cable upward. Caution: Elastomer seals in the sensor and cable are subject to deterioration and aging, and therefore need to be checked regularly. Life expectancy of seals varies with application. UL recognized.